Are we a profession, still? Lately, I have been hearing people say that the CPA profession has been acting more like an industry than a profession. An industry is primarily concerned only about itself and often focused entirely on market share and growth and not much else. A profession is concerned with the public interest and the sustainability of its discipline AND its constituents and their organizations. What does it mean to be considered a profession? A distinct body of knowledge (GAAP, auditing standards, tax and more). A commitment to ethics and a code of conduct. At the MACPA, we like to say that No. 3 is our middle name — Certified Public Accountant. The “P” for public comes from the earliest beginnings of our profession as the third state in the nation to enact legislation creating a CPA license more than 111 years ago! It was during the big shift to the industrial age that a need for a new profession of financial experts was needed. This includes CPAs in public practice and those in business, industry, government and non-profits. In fact, some of our earliest MACPA members were CFOs and controllers at B&O Railroad, and the Baltimore Gas & Electric Company at the turn of the century. All CPAs are essential to our maintaining the public interest of our profession. Which brings me to our New CPA Swearing-In Ceremony coming up on Nov. 1 at the BWI Hilton Hotel. This special event was started in 2007 in cooperation with our State Board of Public Accountancy and the Department of Labor, Licensing and Regulation. 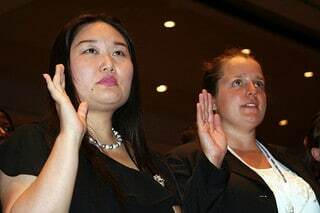 Secretary Prerez of the DLLR administered the first oath to a new batch of CPAs in Maryland and a tradition was born. The oath was designed to put the exclamation point on the CPA license and our public interest. One new CPA at a past town hall said it was the most important experience of her life and that only then did she realize the significance of the CPA license and her commitment to the public interest. This is our chance to celebrate our profession and recognize our newest members and emphasize our public interest. This year the State Board will be handing out the CPA license certificates to the new CPAs and we are honored to have Maryland’s newly appointed DLLR Secretary Leonard Howie III joining us. We will be recognizing the largest group of CPA exam passers in the past five years, an increase of 229 percent since our first ceremony in 2007. Bill captured the significance of this event in his post titled, Oath an ‘Exclamation Point’ on New CPAs Milestone. I think we are still a profession, and at the MACPA we want to make sure we stay a profession. We believe in CPAs and our profession. It’s been our core purpose since 1901. Will you be joining us on Nov. 1?